On a day when it really mattered, Pride in London’s resolve to “challenge prejudices” melted away, seemingly unable to uphold their own mission statement in temperatures above 25c. 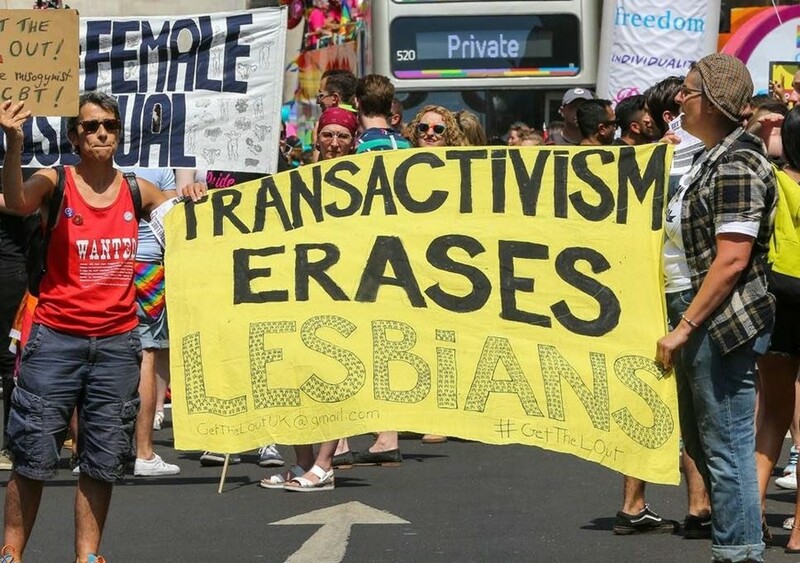 If a group had protested any other part of the acronym, the G, the L or the B, it is hard to believe that Pride in London would let them “move ahead” whatever the weather. There would most definitely not be a further apology stating there was no “criminal offence” made so no action could be taken. Pride in London’s apology is an embarrassment. Trans people deserved to see swift action in the removal of the protestors, vocal support from cisgender allies and a statement from Pride in London that was clear in its denunciation of the protest. Instead, Pride in London gave them a weather report. “It was hot”. LOL. Pride has become a profitable party for global corporations with little genuine interest in LGBT rights putting their best rainbow coloured stalls out for ready for the - ka-ching! - of the pink pound. Proudly marching were companies like British Airways and United States Airlines who are helping goverments deport LGBTQ migrants back to countries where their lives are in danger. Some of those migrants facing deportation may have been on the march themselves, or watching from the pavement. It’s understandable if they felt weird looking at the flags of these complicit companies waving high in the sky. However, Pride in London is not alone in its hypocrisy. Just last week several LGBTQ activists and organisations attended a Pride ‘celebration’ at Number 10, Downing Street. Can you imagine activist Mark Ashton from Lesbians and Gays Support the Miners hanging out in Margaret Thatcher’s back garden whilst also protesting for LGBT rights and being in solidarity with striking miners? Two communities Thatcher was actively trying to destroy through her government's policies? Unlikely. However some of today’s loudest LGBTQ voices are doing exactly that, sipping prosecco in the bank garden of a Prime Minister whose government is destroying our NHS, deporting LGBTQ migrants, outing gay men, and is kept in power by the DUP, an overtly homophobic party. The DUP are blocking any movement on LGBTQ rights or women’s rights to abortion in Northern Ireland. Women and our LGBTQ family in Northern Ireland deserve an apology. If this is queer activism today, is it any wonder that Pride in London and all it represents has come to this? The historically radical and intersectional politics of Pride and the LGBTQ community have become a farce. Pride at its heart is a protest movement and we must never forget that it was trans people of colour who helped create it – Marsha P Johnson and Sylvia Rivera. We must never forget the butch lesbian of colour Storme Delarverie who demanded others “do something”, to which Marsha and Sylvia showed solidarity and responded. We must never forget that the London Pride march of 1985 saw Welsh coal miners, then on strike, march in solidarity with the LGBTQ community against the oppression of a Thatcherite government. We must never forget this alliance was fundamental to us gaining our rights. We must never forget the radical and socialist spirit of Pride. A movement that was started to fight for the liberation of all oppressed people within the queer community: that tried its best to understand that our struggles are connected. That individualism and single issue struggles will never build a movement strong enough to challenge the systems which oppress us.